ONS 2006 Offshore Northern Seas in Stavanger had hundreds of stands, with thousands of exhibitors. Some of those stands caught our eye and here is a selection. ExxonMobil won the best exhibitor award at ONS this year, and rightly so - with a vibrant stand that included three interactive quiz booths, one of which was for teams of two. It was very entertaining, but also informative and thought-provoking: in their assessment of energy requirement growth from now to 2030, we learnt of 500 new coal-powered electricity generating stations in China, for example. Taking this year's theme of "Bridging the Energy Gap" and really looking at ways to make people think about it, they stood out as the oil company that was concentrating. Petoro is a tiny company (60 employees) that manages the oil and gas interests of the Norwegian state (41% of Norway's gas reserves and 27% of the oil reserves) - 66 Billion NOK revenue for the first half year of 2006 - without being operator of any fields. Their expertise lies in advising their partners on how to maximise not just the profit, but also the total output and field lifetime. To demonstrate the value of this work, they had a brilliant interactive "game" that took you from discovery of a field; through the planning decisions (pipeline or tankers? platform, floating production or sub-surface? ); to production and the decisions about maintenance, gas re-injection and implementing smart operations. Complex issues, but demonstrated with great clarity. Statkraft is a major producer of hydro-electric power (97% of their income) and their stand had a large video screen of a waterfall, with massage chairs to relax in in front of it - but that is NOT why we mention it. They are also researching new technologies and power sources, and their enthusiastic and knowledgable representatives explained a lot of the issues associated with hydrogen as a fuel, and also about the future potential of osmotic power - by controlling the interaction between seawater and freshwater - and driving electric turbines with the water flow. In the "good old days" oil wells were drilled straight down into the ground, and tools used during the exploration, production and maintenance phases of a well's life were dropped down the well on a wire. In these days of complex shallow fields, directional drilling makes inclined or even horizontal wells commonplace - and you can't drop tools down a horizontal hole. Enter Welltec, with their Well Tractor system, which deploys driving wheels on hydraulic arms to lock against the side wall of the well and drive the tool to its destination. The stand had good video displays, and also the tractor itself, in a hole through several tons of rock. This was another finalist for best stand. 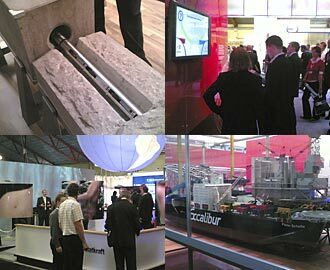 In the "dutch sector" of Hall B was the stand of Allseas - an operator of pipelay barges and pipeline trenching vessels, amongst other things. Nice models of vessels, but again we found enthusiastic people who knew their stuff and could explain the details of laying pipelines. If you ever wondered about the difference between "S-lay" and "J-lay" pipelines, this was the place to ask. The same stand had a large and truly amazing model of a platform removal (and installation) vessel called the Pieter Schelte - planned to be completed in 2009. This twin-hulled (catamaran) vessel - each hull the length of the Queen Mary II cruise liner - will be able to clamp itself around a platform and remove (or install) the topsides, before swinging around and pulling up the platform legs. This project is managed by Excalibur Engineering - a dramatic solution to the growing problem of obsolete offshore production platforms. These are just a selection of the excellent stands that we visited - if we have not included an outstanding exhibitor then please let us know, and thanks to all the people who made our - and thousands of other visitors - visits to ONS so interesting this year.